On a clear night in 1941, a hand grenade explodes in a Cairo bar, taking the life of Stern, a petty gunrunner and morphine addict, nationality unknown, his aliases so numerous that it’s impossible to determine whether he was a Moslem, Christian, or Jew. His death could easily go unnoticed as Rommel’s tanks charge through the desert in an attempt to take the Suez Canal and open the Middle East to Hitler’s forces. Yet the mystery behind Stern’s death is a top priority for intelligence experts. Master spies from three countries converge on Joe O’Sullivan Beare, who is closer to Stern than anyone, in an effort to unravel the disturbing puzzle. The search for the truth about Stern leads O’Sullivan Beare through the slums of Cairo to a decaying former brothel called the Hotel Babylon, populated by unusual characters. Slowly, the mystery of Stern unravels as Whittemore explores the tragedy and yearning of one man fighting a battle for the human soul. 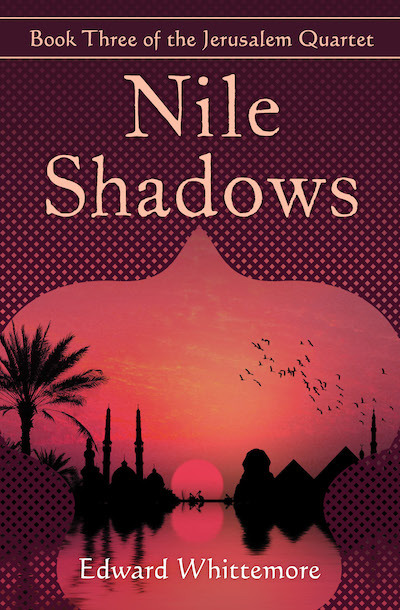 Nile Shadows is the third volume of the Jerusalem Quartet, which begins with Sinai Tapestry and Jerusalem Poker and concludes with Jericho Mosaic.